Amatrol’s PLC HMI Learning System – Siemens ET200 (89-HMIET200) uses a Human Machine Interface (HMI) panel to teach HMI configuration, operation, and troubleshooting in ET200 Safety PLC applications. HMI panels give users the ability to control a machine or process, as well as to view machine or process status, PLC I/O status, operational information, and much more! Some common careers that use industrial HMI applications include machine operators, maintenance technicians, and supervisory personnel. This learning system covers vital HMI knowledge, including: Siemens HMI construction, configuration, and operation; application editing; and WinCC flexible software. The PLC HMI training system includes real-world, industrial components such as an MP277 HMI touch screen panel and HMI to PROFINET cable. 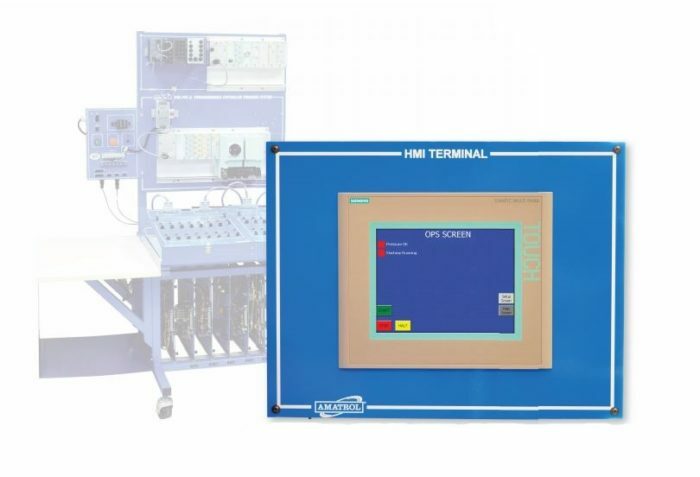 This HMI panel is a programmable operator station that provides interaction between users and the Siemens ET200PRO-Safety PLC Troubleshooting Learning System (890-ET200SF). This training system also includes in-depth curriculum, an instructor’s guide, and an installation guide. The PLC HMI training system allows learners to operate and program a Siemens MP277 HMI touch screen panel. HMI panels are rapidly replacing the traditional panels that control machines and processes in industries around the world, so now is the time for learners to gain real-world HMI competency. This can be accomplished by practicing hands-on skills with the PLC HMI training system, such as: configuring the communications settings for the Siemens MP277 HMI panel; creating and formatting a project screen with text objects; creating and configuring a Symbolic I/O field button input object; and many more. The PLC HMI training system features Amatrol’s world-class curriculum, which covers: different classes of Siemens HMI panels; configuring a panel; transferring applications to a panel over a network; operating an MP277 panel; configuring HMI projects with WinCC flexible software; using WinCC to add screens, push buttons, and output indicators to an HMI project; and learning about symbolic output objects and I/O field objects. Amatrol’s curriculum covers a vast depth and breadth of HMI knowledge, which gives learners a theoretical background on how components fit into a program, which aids in troubleshooting skills. This PLC HMI training system combines Amatrol’s PLC Troubleshooting Learning System – Siemens ET200Pro – Safety (890-ET200SF) with the 89-HMIET200. Learners will study PLC programming, operation, and troubleshooting for safety PLCs, which enable production to resume quickly following a safety related interruption. Safety PLCs provide safe operation of a machine or process by improving fault detection and diagnostics in automated systems. In addition to the PLC HMI training system, the 890-ET200SF features an array of safety PLC learning options. Additional learning systems include: ET200S Stack Light Learning System (89-SLET200), ET200 RFID Learning System (89-RFET200), and ET200PRO Profinet Pneumatic Learning System (89-EPN1).